The site of the 1773 massacre of the son of Daniel Boone and of the son of William Russell – James Boone and Henry Russell – is the subject of a long and continuing controversy in Lee County. The state historical road side marker commemorating this event was originally placed along side US 58 in Eller’s Gap on Powell Mountain between Pattonsville and Stickleyville. A rival claimant later developed in western Lee County, and roadside marker was dug up in the middle of the night and replanted near Kaylor. In recent years a new road side marker was erected by the State in the center of Sticklyville. Local traditions still abound, especially near the various springs that head up Wallen’s Creek north of Duffield and east of Stickleyville, and down Wallen’s Creek all the way to its mouth. The following is a review of the murders, and of the evidence on the location of the site. The Great Warrior’s Path was the most significant of the numerous Indian trails in the eastern United States. It connected the Northeastern and Midatlantic regions with Kentucky and the region between the Ohio and Mississippi Rivers. Daniel Boone’s name is indelibly stamped upon it, and it is also known by the names The Wilderness Road and the Great Kentucky Road. There are several variations of this trail in western Scott County and eastern Lee County. The Hunter’s Trace skirted the southern face of Powell Mountain from Pattonsville to Blackwater, where it crossed Powell Mountain at Hunter’s Gap, and passed on a mile and a half west of the mouth of Wallen’s Creek on Powell River, which it crossed at White Shoals. Another route crossed Powell Mountain via Kane Gap between Duffield and the head of Wallen’s Creek, which it followed to Stickleyville. Here one version crossed Wallen’s Ridge to the head of Station Creek, and on to the west to the northern end of the White Shoals ford. Back at Stickleyville, another variation continued on down Wallen’s Creek for 2 ½ miles to Fannon’s Spring, and crossed Wallen’s Ridge via Slagle’s Gap to the mouth of Station Creek. The last version continued down Wallen’s Creek and for a mile and a half past its mouth, where it joined the Hunter’s Trace. 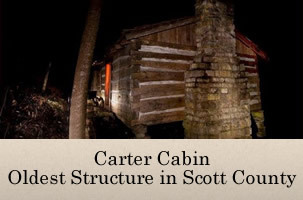 In 1773 the western extent of pioneer settlement was Castlewood in Russell Co. and the Blockhouse in Carter’s Valley in Scott County, near Kingsport, Tennessee. Daniel Boone had decided to move his family from the Yadkin Valley of North Carolina to Kentucky, and had persuaded Capt. William Russell of Castlewood to do so also. On September 25, 1773 the Boones and five other families sat out, and upon reaching Wolf Hills at present Abingdon, Daniel dispatched his seventeen year old son, James, and the Mendenhall brothers, John and Richard, to leave the main party and to go to Upper Castlewood to pick up Capt. Russell and his party at Russell’s Fort. Daniel continued on down the main Wilderness Trail to east of Kingsport, and then on up old US 23 to Duffield. There is no record of whether he accessed Powell Valley by way of Kane Gap, or of Hunter’s Gap. Once in Powell Valley the Boone Party joined the party of William Bryan, which contained about forty people. We know that he camped that night on the northern side of Wallen’s Ridge, which itself is north of Wallen’s Creek. James followed present US Alt. 58 to Castlewood and found that Russell and his party of about forty pioneers were not ready to leave. To carry this news to Daniel, Russell’s seventeen year old son, Henry, and James Boone along with Isaac Crabtree, the Mendenhall brothers, and two slaves, Adam and Charles, were dispatched on Oct. 8th ahead of the main Russell party. Also among the emigrants from the Russell Party were the Hargis brothers – Samuel, Whiteside, William, James, John, Benjamin, and their families. They left Russell’s Fort with James Boone and his party, which traveled down the Clinch Valley branch of the Wilderness Trail until they regained the main Wilderness Trail just north of Natural Tunnel. Daniel and his party camped along the Wilderness Trail on the north side of Wallen’s Ridge somewhere in Powell Valley, and waited for the Russell party to catch up. It was, of course, the party of James Boone that was trying to catch up with Daniel, and not that of Russell. Somewhere James’ party lost the trail, and night fall caught them somewhere on Wallen’s Creek, three miles east of Daniel’s camp. James could have lost Daniel’s trail either at Duffield or at Stickleyville, depending whether Daniel had taken the Hunter’s Trace, or the Warrior’s Path over Kane Gap and then on to the head of Station Creek. It is at this point that the speculation begins. The Wilderness Trail at this time was just a foot path. Horses were usually led as pack animals, and not ridden. The Trail from Kane Gap was a corridor rather than a single path, as it followed a branching network of buffalo trails. At times of low water the travelers tended to stay on the flat northern bank of Wallen’s Creek, but during muddy and wet times they took the ridge line further to the north of the creek bank. There are three variations of the Wilderness Trail leaving Stickleyville to the west, and we do not know which versions were being traveled by James, and perhaps Daniel. All three versions enter Wallen’s Creek Valley via Kane Gap, and proceed down Wallen’s Creek to present Stickleyville. There is a fork in the trail at this point, with one following present US 58 on across Wallen’s Ridge into the Valley of Station Creek, which runs parallel to Wallen’s Creek, both emptying into Powell’s River. Another variation of the Wilderness Trail continued on west down Wallen’s Creek to Fannon’s Spring, which is about two and a half miles west of Stickleyville. Implicit in the circumstances of this story is the fact that the party would have camped by a spring. The pioneers did not usually drink out of creeks anymore than we do. Fannon’s Spring lies between the road and the creek, and its flow is so great that it boils in a mushroom shape up out of the ground. Its fresh cold water attracts fish as it empties into the creek. It is simply the best spring for miles around. It was at this point that the trail began its ascent of Wallen’s Ridge on its way to Slagle’s Gap, and joined the trail on Station Creek at its mouth on Powell River. A third version continued on down Wallen’s Creek to its mouth on Powell River, and crossed to the north side to rejoin the versions of the Wilderness Trail coming west from the ford at the mouth of Station Creek. The militiaman John Redd, who had gone with Joseph Martin in 1775 to Martin’s Upper Station at Rose Hill by way of the Wallen’s Creek route, stated that “the old Kentucky Trace crossed Walden’s ridge at the head of Walden’s Creek”. This is the current route of US 58 west of Stickleyville. It implies that Redd believed that Daniel would have gone this way, but Redd admitted that his first trip to Kentucky was in 1780, some seven years after the massacre, a situation that gave plenty of time for the route of the trail to have changed. General Joseph E. Johnston of Confederate memory, he had it from a Mr. The location of the murder of James Boone depends on which version of the Wilderness Trail Daniel was traveling, and which route James took in the process of getting lost. We know that nightfall of October 8th caught the party of James Boone and Henry Russell still on Wallen’s Creek. “Wolves” howled all night around the camp of the James Boone party. The Mendenhall brothers paced up and down all night. At dawn, a mixed party of Shawnee and Cherokee Indians attacked, and shot James Boone and Henry Russell through the hips so that they could not escape. They were tortured with knives. Boone recognized his torturer as Big Jim, a Shawnee who had been a guest at Daniel’s home in the Yadkin. Boone resisted for a while, but with his hands shredded from fending off the knife, he pleaded with Big Jim to kill him and to put him out of his misery. Russell was clubbed, and his dead body shot full of arrows. The Mendenhalls, and Whiteside Hargis were also killed. It is not clear how Crabtree made his escape, but he returned to the settlements in the east. Adam hid under a pile of drift wood on the bank of Wallen’s Creek, and witnessed the massacre, and later returned to the settlements where he spread the news. He and Crabtree were the sources of the information that was written into the dispatches of the Holston Militia that wound up as part of the Draper Manuscripts, which are today’s documentation of this event. Charles was carried away toward captivity. The story varies somewhat at this point. One tradition says that the massacre was discovered by a deserter from Daniel’s party. Another source says that Capt. William Russell’s party came upon the scene, and dispatched a runner to Daniel. The party of Daniel Boone returned, and Rebecca, James’s mother, wrapped the bodies of James and Henry up together in a linen sheet, and they were buried in a common grave. The Boone and Russell parties returned to Castlewood. The Indians, taking Whiteside Hargis’ wife, John and William Hargis, and John’s son who was named after his Uncle Whiteside, along with the slave Charles, made their way back up Wallen’s Creek to Dry Creek at Stickleyville, and thence to Kentucky, probably by way of Lovelady Gap, and either Olinger Gap or Eola Gap to the head waters of the Cumberland River. Somewhere along the trail, John Hargis and his wife and daughter made their escape, and settled back in Castlewood. Young Whiteside was adopted by the Shawnee, and later in life joined Chief Benge in his raids against the settlers in the area of his capture. The Indians along their way began to argue about the ownership of Charles, and the issue was resolved by his being tomahawked. traditions were still fresh and widely held. The Hargis information is obtained from Henrietta Hargis Reynolds’ article in The Heritage of Russell Co. vol II. Stickleyville are impossible. This is especially true of those sites at the head of Wallen’s Creek, which is so small there that it can be stepped across. We know that Daniel and James took different trails, as James “got lost”. Since James was on Wallen’s Creek, and was lost from Daniel’s trail, this means that Daniel had taken either the Station Creek version of the trail, or the Hunter’s Trace. If the Russell Party was the one that discovered the massacre of the James Boone Party, and since we know from several sources that the massacre occurred on Wallen’s Creek, then it would seem that Russell had known to follow the parties of Daniel and of James down Wallen’s Creek. It is important to note that at its nearest point, the Hunter’s Trace passes 1 ½ miles to the west of the mouth of Wallen’s Creek. Therefore Russell in his following of the Boones had known that they were not to have traveled on the Hunter’s Trace. If one discounts the Fannon’s Spring tradition, and discounts Russell having discovered the massacre, there are only two possibilities for these events to have unfolded. The first is for Daniel to have camped north of Powell River (which is north of Wallen’s Ridge) somewhere in the Flatwoods or White Shoals area, and for James to have camped near the mouth of Wallen’s Creek. The Wallen’s Creek Trail and the trail that had come from Station Creek come together at White Shoals. This would have placed James about three to four miles east of Daniel, and also would have allowed the deserter from the Daniel Party to have backtracked to the east on a different trail from the one he had followed with Daniel. The other possibility is for Daniel to have camped at the mouth of Station Creek, and James to have camped at Fannon’s Spring. The distance between these two sites is also about three miles, and would have also allowed the deserter to have taken a different route back east and to have stumbled upon the massacre. However, if one credits either the Fannon’s Spring tradition of Mosley, or the tradition that Russell discovered the massacre there is only one possibility. The preponderance of evidence points to Daniel’s having camped at the mouth of Station Creek, and James at Fannon’s Spring. It is, after all, about fifteen miles from Fannon’s Spring to the mouth of Wallen’s Creek and to the Flatwoods segment of the Wilderness Trail. The Wallen’s Creek location documented by the Draper Manuscripts excludes the tradition locating the massacre in western Lee County near Kaylor. Also, the western Lee County site is over a hundred miles from Castlewood, easily twice the distance that the James Boone party could have made in the one day that they travelled. After burying their dead, the Boone and Russell parties returned to Castlewood.